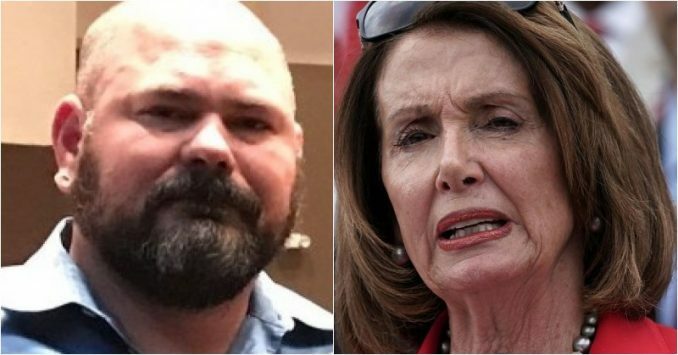 Nancy Pelosi is getting a lot of heat from Angel Dad Chris Odette. The military veteran lost his 13-year-old daughter, Chrishia, to a drunk illegal alien driver. Making matter worse, Odette lost his wife to breast cancer. Now, Odette just confronted Nancy Pelosi, asking, “Is it immoral she has a wall around her house?” And then he went on to destroy her. Don’t miss this. Chris Odette takes his responsibility as an Angel Dad seriously. It’s been almost five years since he lost his beloved daughter to an illegal alien who was driving drunk without a license. Only months before, Odette had to bury his wife, who succumbed to breast cancer. He didn’t know how he would go on when he lost his wife, but within a few months, he was burying his daughter next to her mom. Yet, the Democrats claim there is no border crisis. “Odette’s daughter, Chrishia Odette, was just 13 years old when, on September 12, 2014, unlicensed driver and illegal alien Ramiro Tolentino Guevara careened into the girl’s body. Odette recounted the authorities’ description of the blood that streamed from her face after being struck and the professionals who said she may have lived for minutes with her injuries before dying,” Breitbart reported. Odette, a military veteran, told Breitbart News in an exclusive interview Wednesday that he has tweeted Speaker Pelosi and Senate Minority Leader Chuck Schumer numerous times, inviting Pelosi to meet and talk about his daughter’s death, but he has received no response. “Odette said he has a card with his daughter’s name, photo, and date of death, along with his contact information, which he wanted to give Pelosi,” Breitbart added. “If that wall is immoral now and it wasn’t a few years ago, then why hasn’t she introduced legislation to have it all torn down?” Odette questioned. Angel families gathered outside Pelosi and Chuck Schumer’s office last week, and all they got was the runaround. The Democratic leaders couldn’t even spare a few minutes to listen to these families’ concerns, but they sure have all the time and energy to advance the cause for illegal aliens and open borders. That’s when they started chanting right outside their offices: Build the wall! Americans are livid over the horrendous treatment that these Angel families have had to endure at the hands of the Democrats. It’s sick. The party of Pelosi blocking the wall to spite President Donald Trump, but a secure border is something all nations must have to keep their sovereignty. They take an oath to serve the American people, but they only serve themselves. Can you imagine if your child was killed at the hands of an illegal alien who had no right to be in this country? Most of us have put ourselves in Angel families places, trying to fathom the unspeakable horror they go through. Of course, we cannot begin to understand. Let this all renew us to keep the pressure on those rats in Congress. And if our president gets blowback for doing the right thing without them, let’s make sure we all have his back, too.